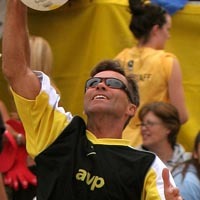 An elite Beach Volleyball player in his younger days, Dane Selznick has served as an United States Olympic coach three times. He coached American Olympic tandems of Barbra Fontana/Linda Hanley (Atlanta 1996), Rob Heidger/Kevin Wong (Sydney 2000), Misty May-Treanor/Kerri Walsh (Athens 2004). Fontana and Hanley was the United Stades� top finishing women�s team in Atlanta after losing the bronze medal match to Natalie Cook and Kerri Pottharst of Australia. Four years later, Cook and Pottharst captured the Sydney gold medal. Heidger and Wong, who entered the Sydney Olympics as the United States� top men�s team on the SWATCH-FIVB World Tour, tied for fifth on Bondi Beach after being eliminated by eventual gold medalists Dain Blanton and Eric Fonoimoana. A native of Santa Monica, Calif., Selznick was honored as one of the "Legends of the Beach" at the 1997 SWATCH-FIVB World Championships, and Volleyball Magazine listed Selznick as one of the Top Ten defensive players of all time. The six-foot Selznick began his beach career in 1975 and earned his first win of 13 in 1978. The former beach World Champion was a finalist in 39 tournaments, and finished in the top four 78 times in 126 events with 27 different partners. Selznick has coached over 160 professional players - both national and international � on the FIVB, Association of Volleyball Professionals (AVP), Women�s Professional Volleyball Association (WPVA), four-Women, and Beach Volleyball America (BVA) tours since 1993. Following Atlanta Olympics, Selznick worked with teams from Australia (1998) and Norway (1999) before coaching Heidger and Wong. He has also coached international teams from Austria, Brazil, Canada, China, France, Israel, Japan and Puerto Rico. Selznick, who helped introduce the beach game in Australia in 1979, was a member of the 1973 national championship high school team at Pacific Palisades (Calif.) High School when he earned prep All-American honors. The 1975 USVBA National Rookie of the Year, Selznick was also a two-time junior college All-American at San Bernardino Valley College (1975-76). Selznick earned his AAA beach rating at the Sorrento Open in 1976 with Mike Anapol. The third cousin to David O. Selznick, the movie producer, Selznick has worked in the movie and commercial business for 26 years. Selznick�s father (Gene) was also named a "Legends of the Beach". His father, who was also a indoor volleyball standout, coached May and Holly McPeak at the Sydney 2000 Olympic Games. Both his brothers (Bob and Jack) played volleyball. Selznick and his wife (Cecelia Ceccone) have three sons (Jake, Brian, and Shane).